Northshore Study (NS) Area: Covering Clearlake Oaks, Nice and Lucerne. 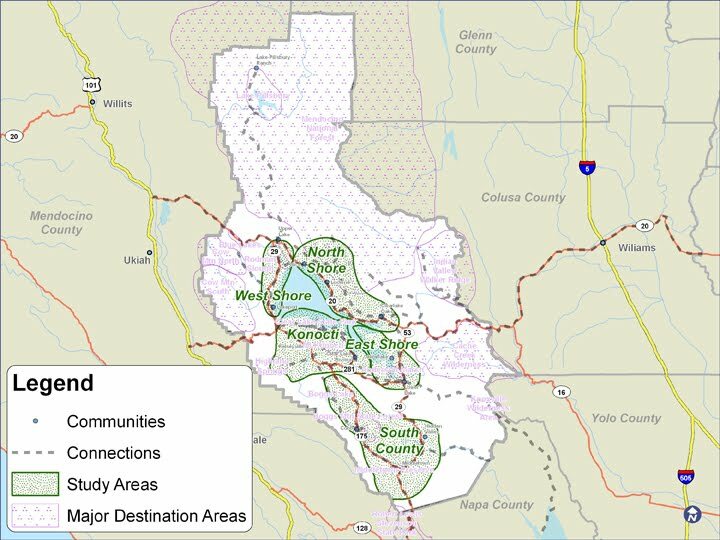 Within each study area, a list was made of existing trails, proposed trails (those proposed and approved in county/area plans) and conceptual connections (wish list). The conceptual connections were developed from Workshop 1 and 2, and the Online Survey. Regional Trails, connecting neighboring communities or regionally significant attractions. Local Trails/Pathways, connect neighborhoods to schools, shopping; trails within parks. More info on the study areas and results of the workshop can be found in the sidebar under Trails Study Areas.